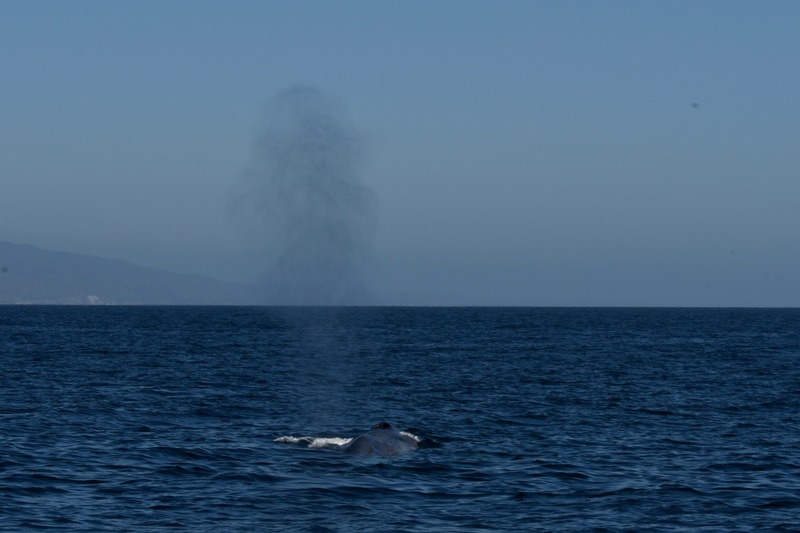 Off the coast of Dana Point, California. 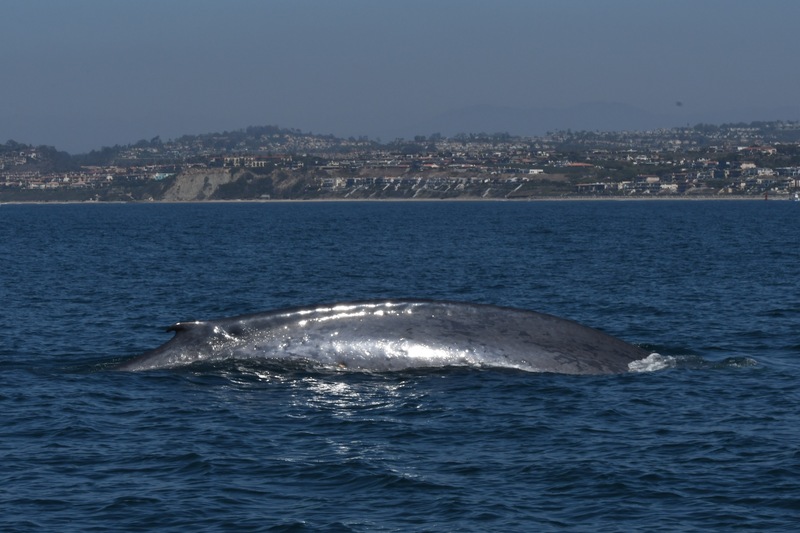 Meeting for the first time, the incredible amazing Blue Whale. Bigger than any creature that has ever lived on our planet. A Gentle Giant, we are in awe. 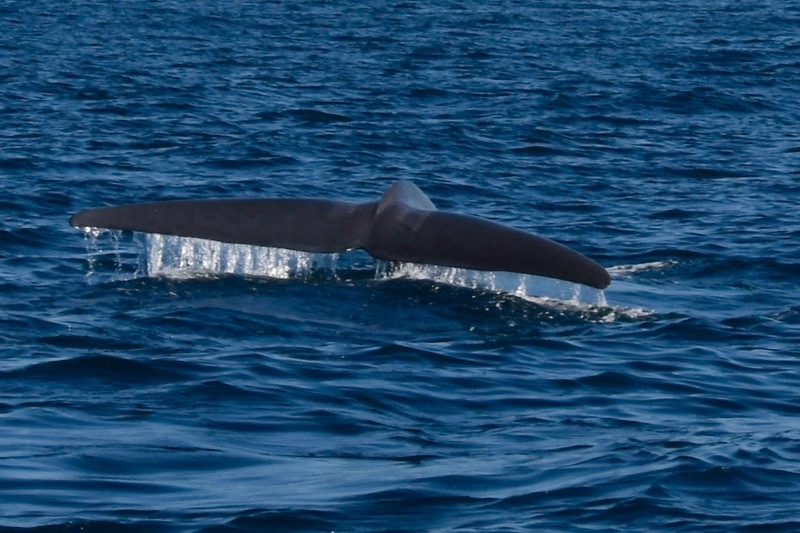 The biggest heart in the world is inside the blue whale. It weighs more than seven tons. bending only to step through the valves. The valves are as big as the swinging doors in a saloon. 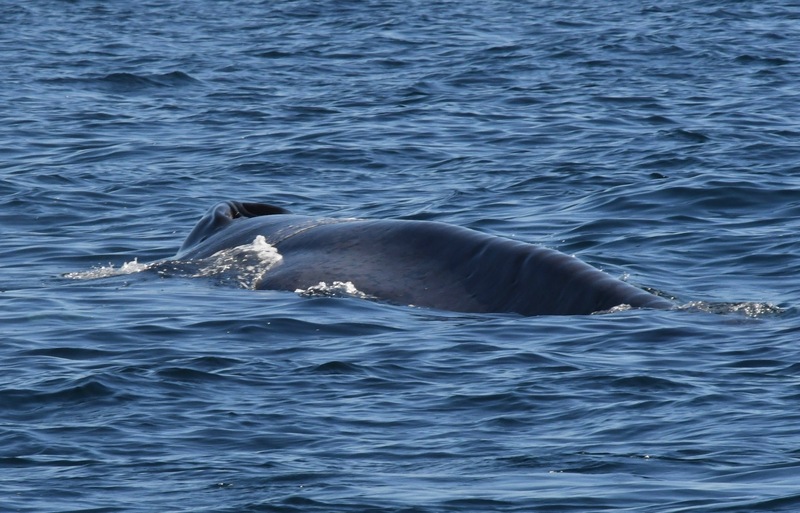 language, social structure, diseases, spirituality, wars, stories, despairs, and arts of the blue whale. their piercing yearning tongue, can be heard underwater for miles and miles. fluid eternally in motion, washing from one side of the cell to the other, swirling and whirling. No living being is without interior liquid motion. We all churn inside. So much held in a heart in a lifetime. So much held in a heart in a day, an hour, a moment. the kitchen where he is making pancakes for his children. Reprinted from The American Scholar, Volume 73, No. 4, Autumn 2004. 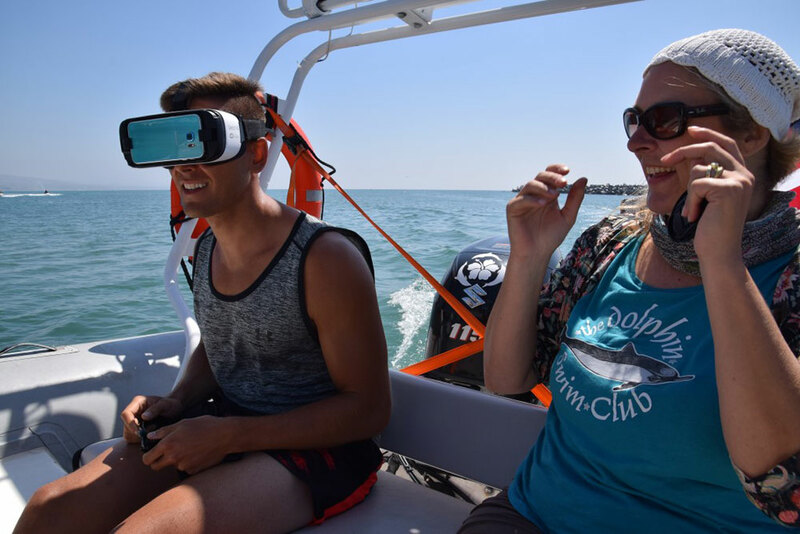 Ever since we started with the Dolphin Swim Club VR experience, on behalf of (or perhaps even requested by) the dolphins, our lives have been filled with adventures and sea creatures of all kinds. As well as with people with a big heart for the sea, or even simply a heart as big as the ocean. Friday afternoon, June 10th, we visited the Jewelbox studio with owner Pepijn Buitenhuis. He was working on the last bits of the sound design, with only the natural recorded cetacean voices for the 15-minute healing VR version. So now the dolphins are ready to swim into people’s lives and do their thing! And they are. 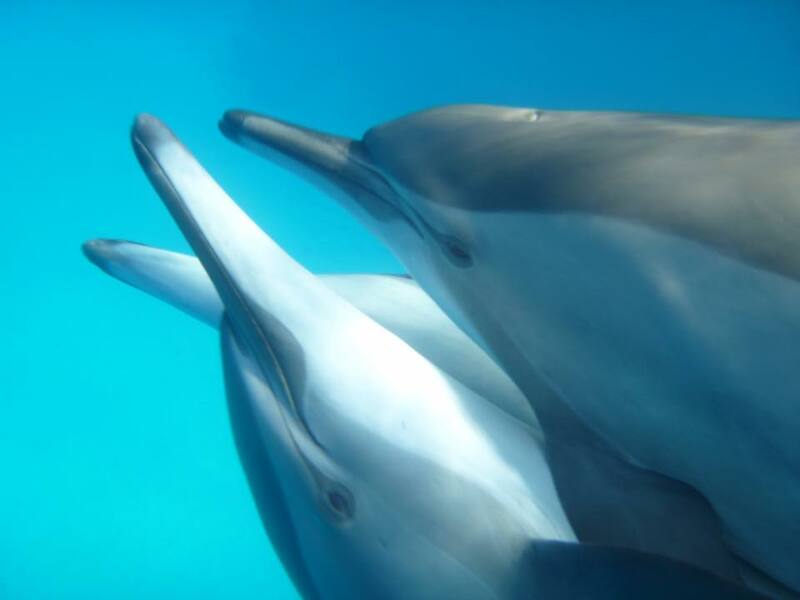 Medical research on the healing effects of wild dolphins, done by UMCG (Groningen University) has started. 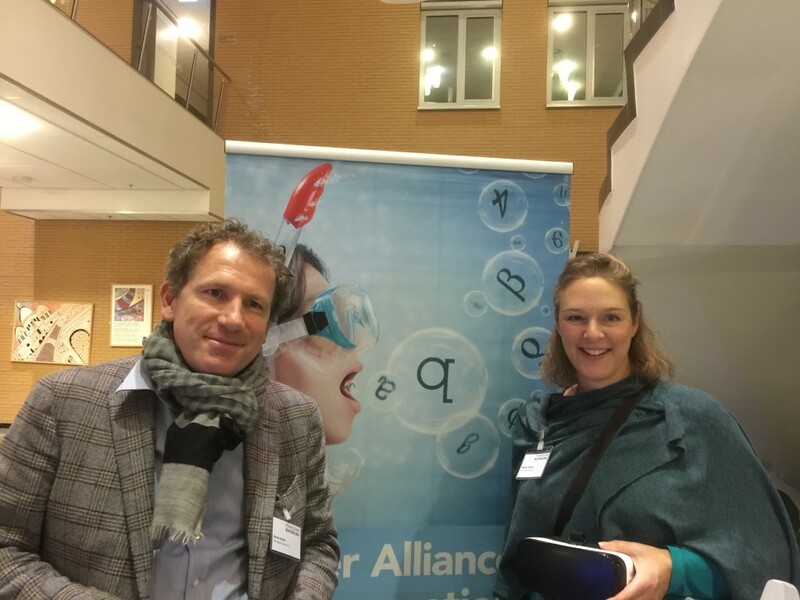 They are joining the VR programmes in several hospitals and healthcare facilities around Europe and the USA, (Cancer Society Oslo, Norway, ‘sHeeren Loo, the Netherlands, UMCG Groningen, the Netherlands, University of Southern California, USA) to name just a few. Safe travels my dear friends. 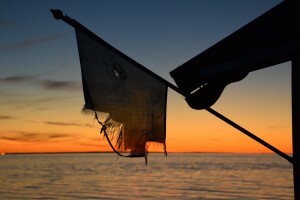 Safe travels to all sentient beings out there in the waters and on the land. A lot has happened since we got back from the shoot in Egypt. The whole team was busy with post-production, the website and meeting wonderful people: pioneers in the world of 360° Virtual Reality, people working in healthcare, medical research, animal welfare, research and rescue, environmental protection, education, marketing, the cultural field and journalism. By itself, it is a great joy to meet all these people passionately trying to make the world a better place by doing what they love. 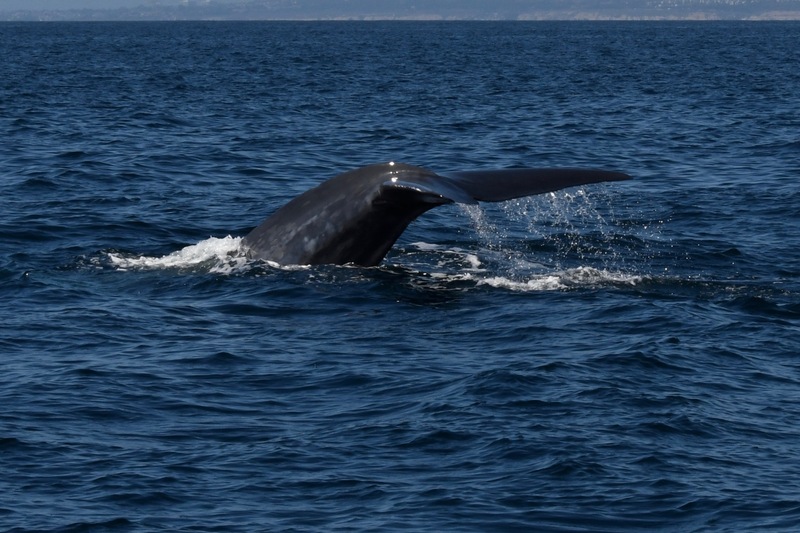 So here is the follow-up story with a very grateful heart, to all beings involved and especially the cetaceans of course. The Embassy of the Cetacean ImagiNation, a non-profit start-up presents the Dolphin Swim Club: a healing 360° VR experience. This project is foremost about sharing the joy, playful spirit and beauty of wild dolphins in their home, the free oceans of the world. To meet a dolphin or a whale underwater and look into their eyes is perhaps one of the most amazing encounters one can have on this planet. It is our dream to share this experience through 360° VR, and so inspire a love for the oceans and all its inhabitants. The stress reducing and healing effects¹ of meeting dolphins are widely known. All throughout history there have been many stories and legends accounting that. In modern medicine, these seemingly magical qualities of cetaceans are used in so-called ‘dolphin-assisted therapy’. Unfortunately, the facilities offering these programmes are keeping dolphins in captivity. 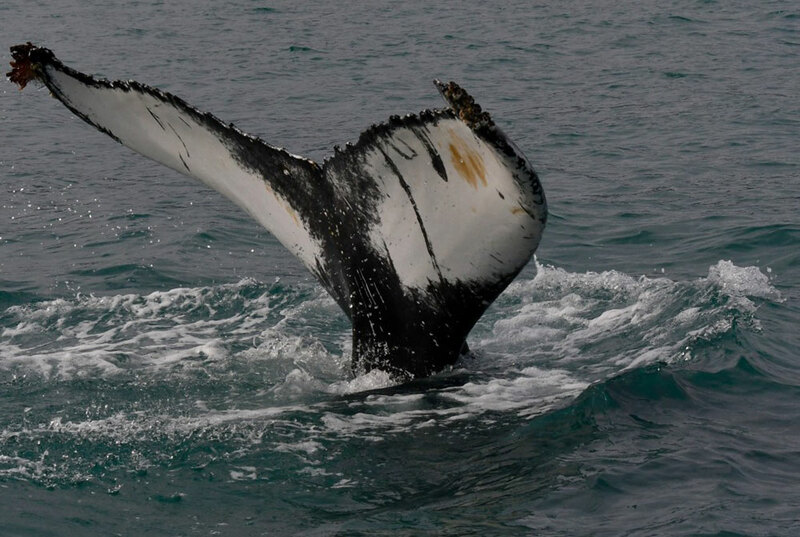 As we continue to learn more about the amazing intelligence, language and complex societies of cetaceans, it has become apparent that this is a highly undesirable situation. Captivity leads to drastically shortened lives and endless suffering. So we thought: ‘Lets make a great alternative’, and we did! In 360° Virtual Reality. 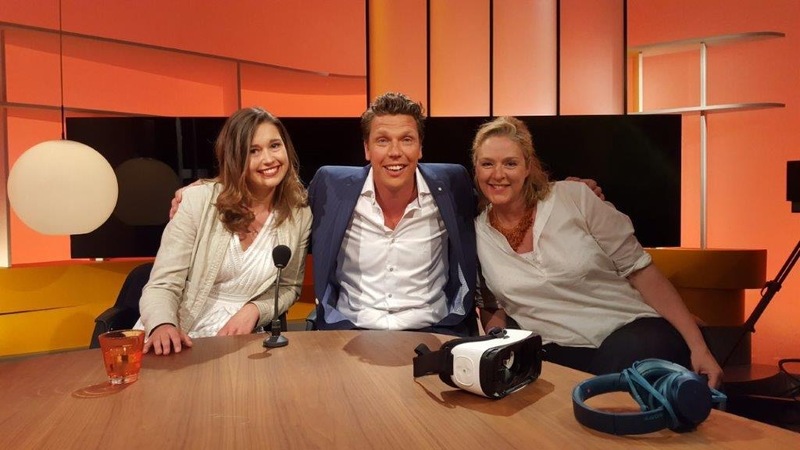 In January 2016, both Dr. Wim Veling of the University Medical Centre Groningen and Professor Skip Rizzo of the University of Southern California decided to start official medical research in the field of depression, psychoses and anxiety disorders and autism by using our VR experience. In April of that same year, we launched our 360° preview which is now available through our special player. 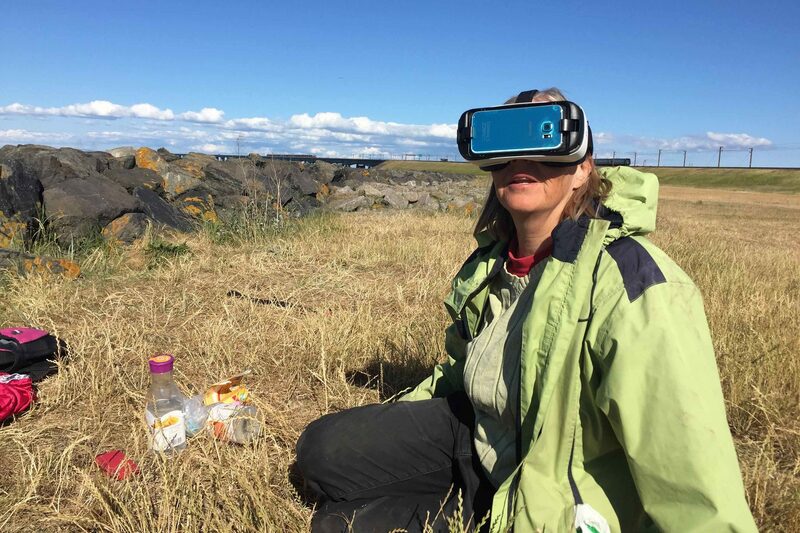 You can order VR Goggles to watch the dolphins with your own smartphone in 360°VR, and you may want to leave a donation to support our efforts, highly appreciated! 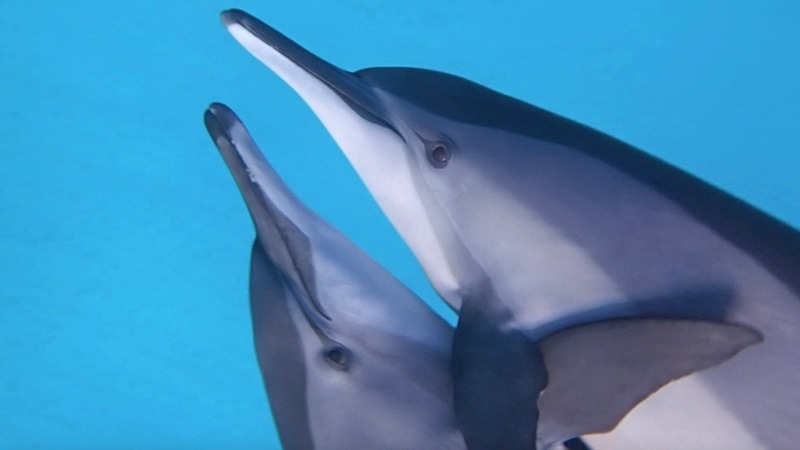 Several health organisations in the Netherlands have pre-ordered the Dolphin Swim Club under water 360°VR dolphin footage. They want to open up the world of multiple disabled patients or provide an opportunity to reduce stress within all kinds of healthcare. 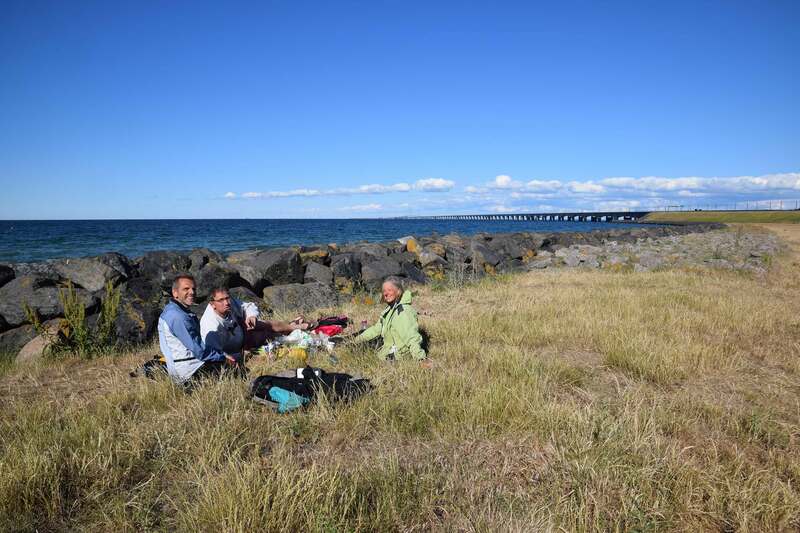 Early May, the Norwegian Cancer Society decided to use our images for the treatment of patients (age 13 to 19) who will undergo bone marrow transplants. 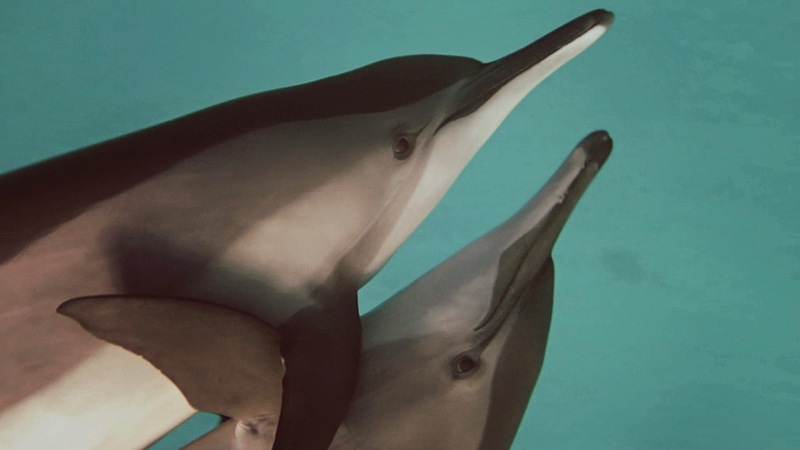 The Dolphins offer a beautiful distraction from life in an isolation room (5-6 weeks). They want to explore practical implications and whether the use of VR can help children and young adults to cope better with the adverse effects of their treatments. Starting May 4th, our high quality 360°VR preview is shown in Amsterdam and Berlin, in Europe’s first VR cinemas. To us, this project is just for fun, as we love to share the joy of the dolphins with everybody. And we think it’s really cool that you can now buy a ticket to the VR movies instead of a dolphin show! Next to the production of several VR films and watching the dolphins find their way into healthcare and delighting viewers everywhere, we do have dreams left. We would love to make waterproof VR-goggles out of waste plastic, taken from the ocean. Because not only cetaceans but all ocean inhabitants would greatly benefit from a clean sea. 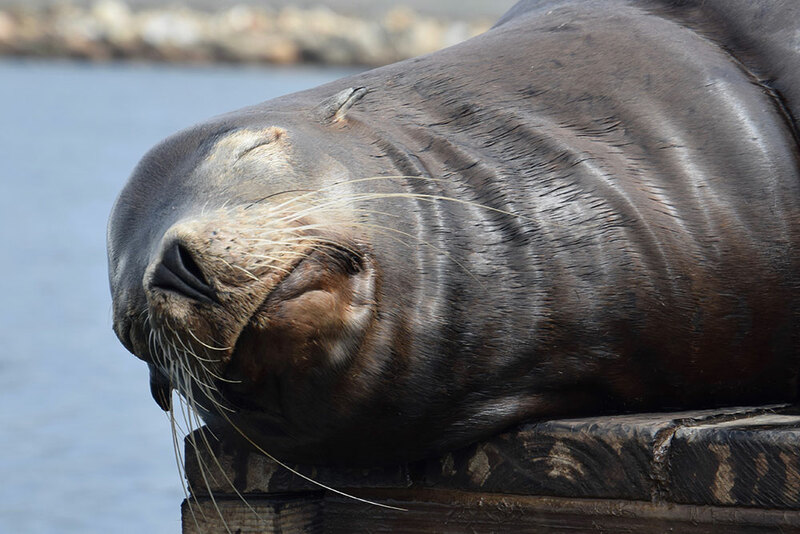 We teamed up with Zeehondencentrum Pieterburen, a Seal Rescue Centre in the Netherlands. They are running a programme gathering abandoned fishing nets (ghost nets) and other plastics from the Waddenzee in the north of the Netherlands. This debris is recycled into a special granulate. The waterproof feature will add an extra sense to the healing experience and would be very suitable for severely paralyzed patients. As a non-profit start-up, all revenues will flow back into the project for the funding of the research and the development of further underwater experiences. I don’t know where to start really. I would like to state that I am super proud of the whole team at the Dolphin Swim Club. The dolphins, the Egyptians, the Dutch, the Belgians, the Swiss, the Germans and last but not least one Irish / Norwegian soul. A true Cetacean-African-European joint venture. With full dedication, we stretched ourselves to the limit. And perhaps a bit further. Especially our free divers Stephen Hutton, Ahmed Ibrahim Hamza and Mohamed Ismael, who were diving with the heavy camera rig until their lungs nearly burst and their muscles almost collapsed. But most of all, we had so much fun during the whole production. Now it is time to get the dolphins home to you. We managed to capture hours of beautiful moments with the spinners. 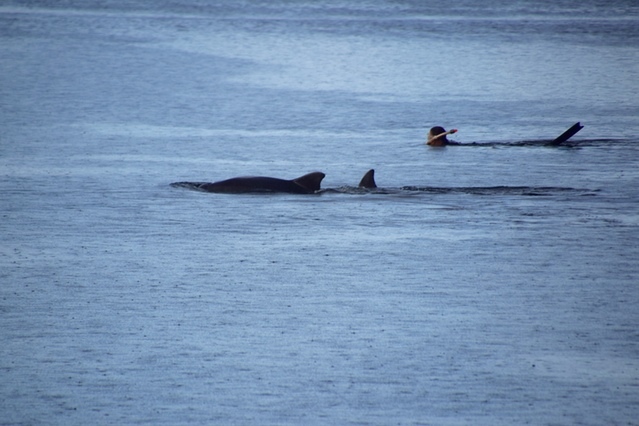 Every now and then a pod of bottlenose dolphins came to visit us. We even managed to record their natural sounds of clicks, squeaks, moaning and singing. It is amazing to listen to their acoustic world and be part of all their grace and playfulness. Like voices from an undiscovered world. Like the most interesting symphony you will ever hear. Accompanied by amazing footage so you can experience being surrounded by dolphins as if you were truly there. We are now back on land and busy editing. Image yourself being surrounded by more than 80 dolphins in the studio… The films are going to be even better than we imagined. And we have so much material to choose from that it will take some time to be ready. We’ll keep you posted! We have some bad news and a lot of good news. To start with the bad news: we didn’t reach the amount of funding we had hoped for. However, almost all our backers have continued their support. So that brings us to the good news. The Dolphin Swim Club goes on! All wondrous events following the inspiration to make a Virtual Reality production about swimming amongst dolphins convinced us to go ahead! 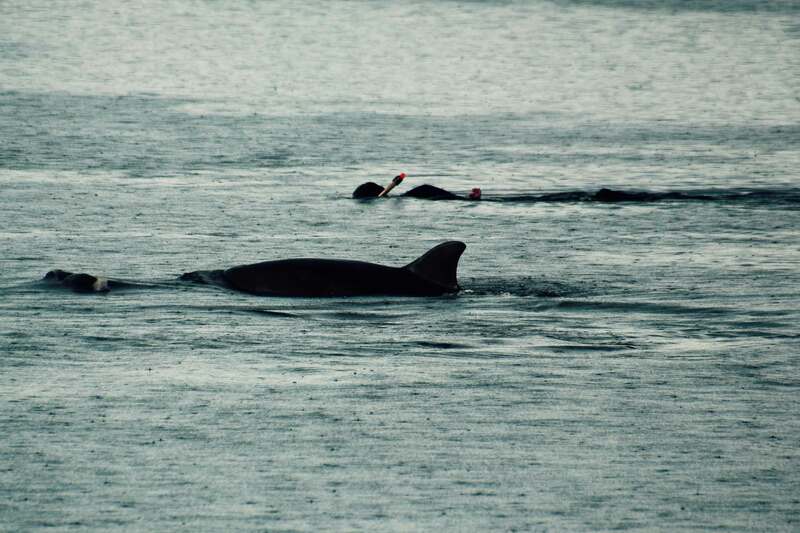 And more good news: the two bottlenose dolphins that so magically appeared at the day of the launch of the Dolphin Swim Club at the front of the ‘headquarters’ in the Baltic Sea, are alive and doing well. 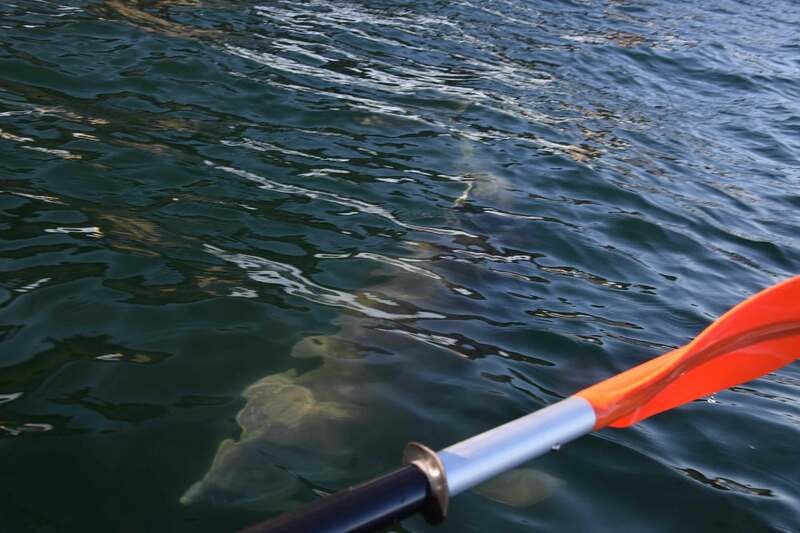 They are slowly moving, visiting different bays and harbours, still delighting people everywhere with their presence. They now have their own Facebook Page: Kalmarsunds delfiner. Here you can find out about their whereabouts. People post their wonderful pictures and films, experiences and questions, as well as some discussions about the best way to interact with them. 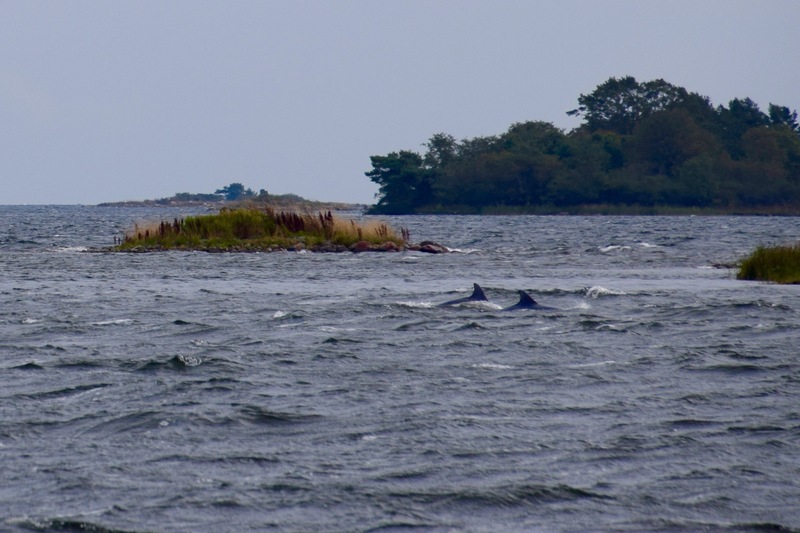 As of course, dolphins are not native to the Baltic Sea, so it’s new to everyone. For the team of the Dolphin Swim Club, we had to make a rather difficult choice. We found ourselves in the middle of this miracle. Every day could be the last to see them. When would they decide to turn back to the North Sea? 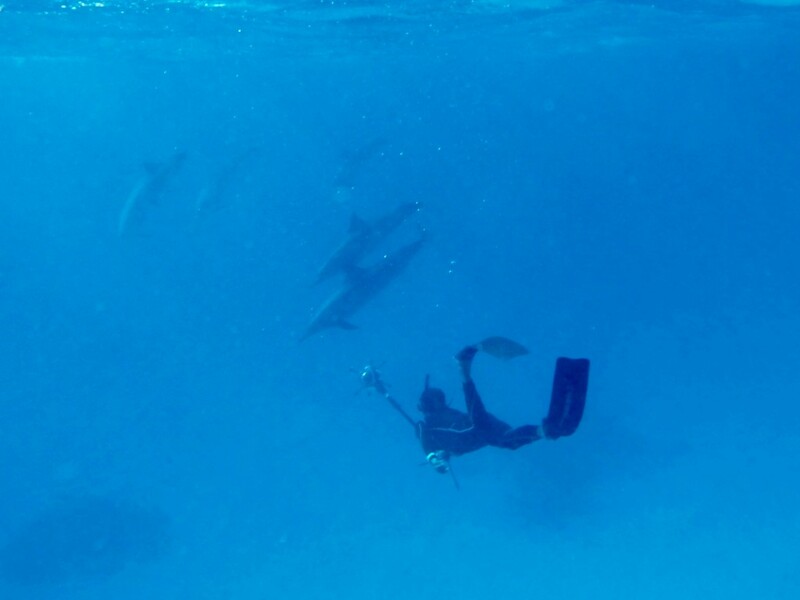 Time spent playing with the dolphins is always the best. That’s why we love to make Virtual Reality films in the first place, to share the magic. And the dolphins gave us beautiful wise advice: life is happening here and now! 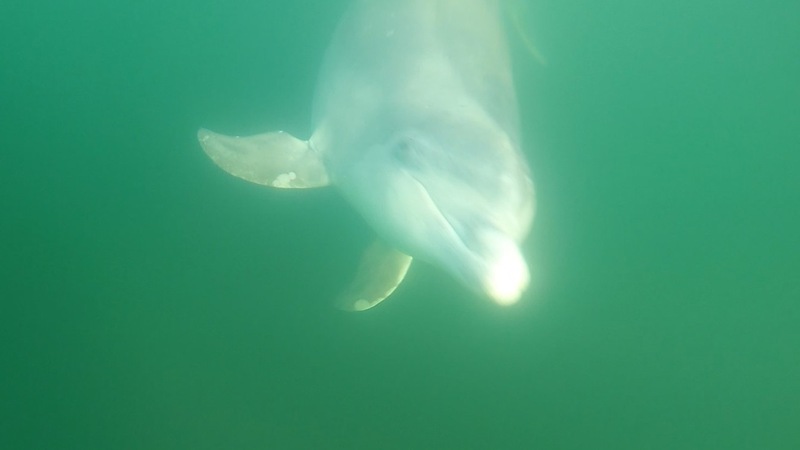 So instead of managing the crowdfunding project from behind a desk we were out playing with the dolphins! Such an adventure! In the process, we have met wonderful people as well. We’ve been out paddling canoes with strangers, we’ve been dining and sleeping in the house of strangers and we’ve been handed coffee, homemade cookies and apple-pie by strangers. We had very special and wonderful conversations with such interesting and talented people. All these strangers soon became new friends. All of us so fully aware of the magical times that the two dolphins brought upon us. This sense of urgency to fully live life. Like flying out to Stockholm in the evening to be in a morning talk show for national television. Getting up at 4.30, being interviewed about swimming with them. Then to take the first flight back to rush to the bay for another paddling tour. Just for the chance to float in the sea, listening to the wonderful puffing sounds of the dolphins breathing and swimming nearby. To see a shimmer of a fin, lit up by a moonbeam. 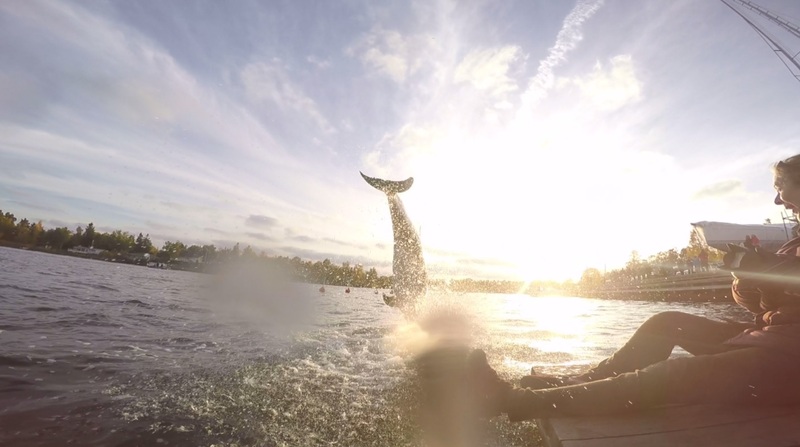 By being the first person ever to swim with dolphins in the Baltic (probably), and by making underwater footage used by Swedish television, we managed to get a chance to talk about the Dolphin Swim Club in both Sweden and the Netherlands. This proved to be helpful in order to find a bit of additional funding for our dream. Other dolphin-lovers offered to donate their time and skills in order to realize the Dolphin Swim Club content. This is really helpful in order to lower the production costs a bit as well. However, the final realization of such a complex production remains a costly business. And the project isn’t yet fully funded. Nevertheless we did decide to take a leap of faith and to go ahead. Imagine you are a child living in a little coastal village in Sweden. One wondrous day two bottlenose dolphins visit your harbour and give a splashing show. The faces of these children, and adults alike actually, inspired us so much. Thinking about meeting the gaze of the dolphins underwater earlier that day, I made a silent promise to all. When dolphins can travel thousands of miles into unknown waters to show up for the opening of the Dolphin Swim Club, we ourselves must certainly cover the whole distance. How amazing would it be to have this experience of dolphin magic available right in your smartphone or computer? Go swimming with the dolphins wherever you are. In the meantime, we have interviewed specialists about using our footage for research in the treatment of patients. In the fields of autism, depression, childbirth, and also post-traumatic stress disorder. The reactions are very positive, so there is a good chance that the dolphin-magic may also work in these settings. And it is also in this area that we have found additional funding. We have just opened up a webshop where you may pre-order, and find the same products as presented on the crowdfunding site. The date of delivery will still be around the end of the year. We have booked a boat for the beginning of December to make the footage. 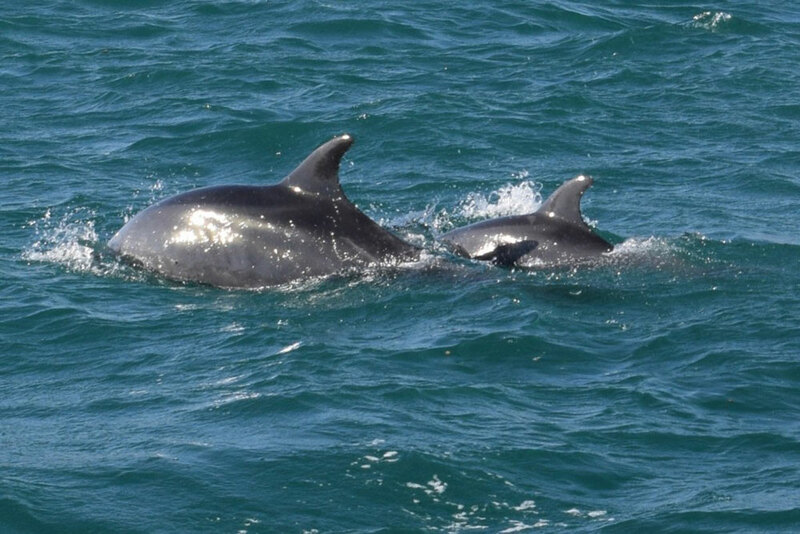 The owners of the boat have supported the project as well with a generous offer and we will be 7 days at a unique location to capture the life and joy of wild and free dolphins. Due to their gift we have now four extra places on board available, in two duo shared cabins. Is swimming with dolphins your dream? Now there is a special opportunity! We invite you to share this unique experience of swimming with spinners and sometimes bottlenose dolphins in the clear aqua-blue tropical waters of the Red Sea. As well as sea turtles, all kinds of colourful fish and amazing coral reefs. Apart from the film crew, there will be a snorkelling/diving guide and a marine biologist on board. And not all that unimportant a great chef who will cook all our meals! There are several decks on board, so there is always space available to sit and relax after spending hours with the dolphins or take a mid-day rest. Apart from that you will probably have the greatest time ever, you will also help us to realize the footage for the Dolphin Swim Club. We are so much looking forward to starting the next chapter of this project, which has been so full of magic so far. A big thank you to everyone for all your support! I leave here with this very warm feeling of gratitude. Allow me to share a little bit more about the strange and magic circumstances around ‘the birth’ of the Dolphin Swim Club. All spring and summer we have been dreaming, talking and working hard to draw up a plan. Countless emails were sent between Sweden, the Netherlands, and the rest of the world. Below you see a picture of the ‘headquarters’ of the Dolphin Swim Club. 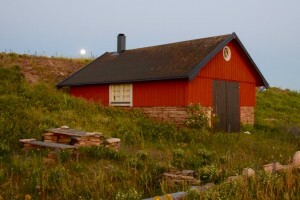 It is a boathouse on the Baltic coast of the Swedish island Öland. 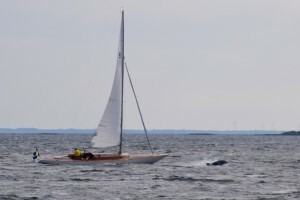 For the whole of that summer there had been sightings of bottlenose dolphins in the Baltic. 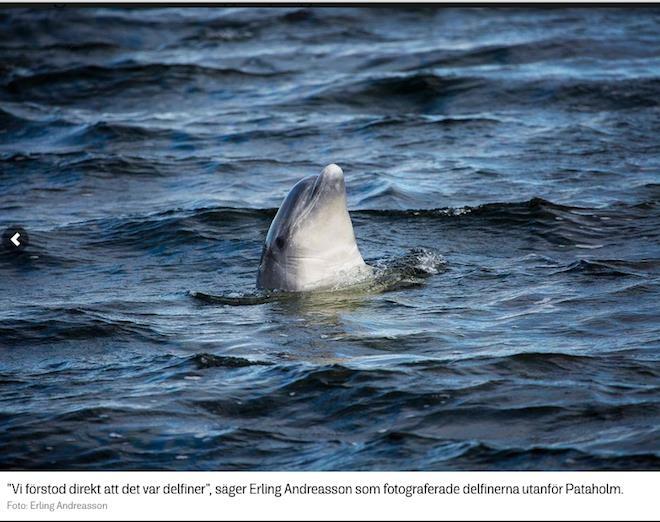 This is very, very, very unusual… Only porpoises are native to the Baltic. 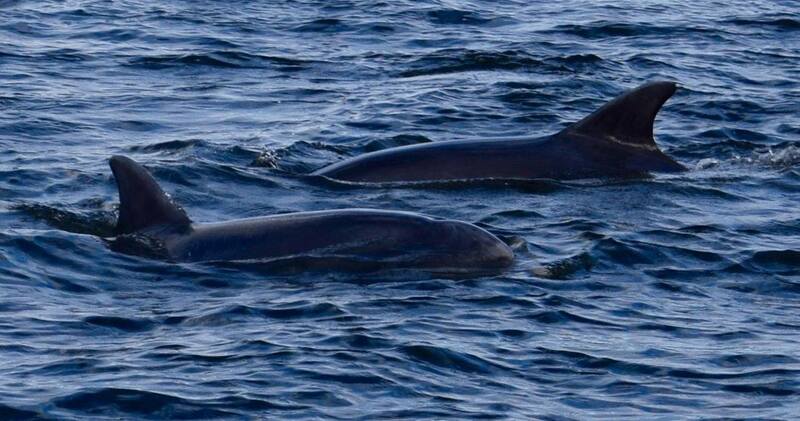 And even these dolphins are hardly ever seen! The Ocean played a role. Because of unusual winds and tides last winter, an enormous amount of salt water could come in. 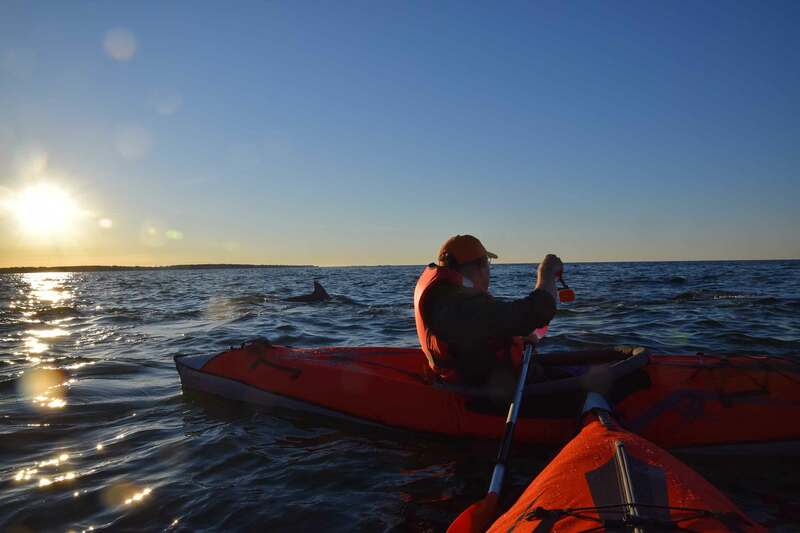 At first there was a lone dolphin, playing and interacting with people in boats, canoes, and little harbours. Bringing excitement and delight everywhere. 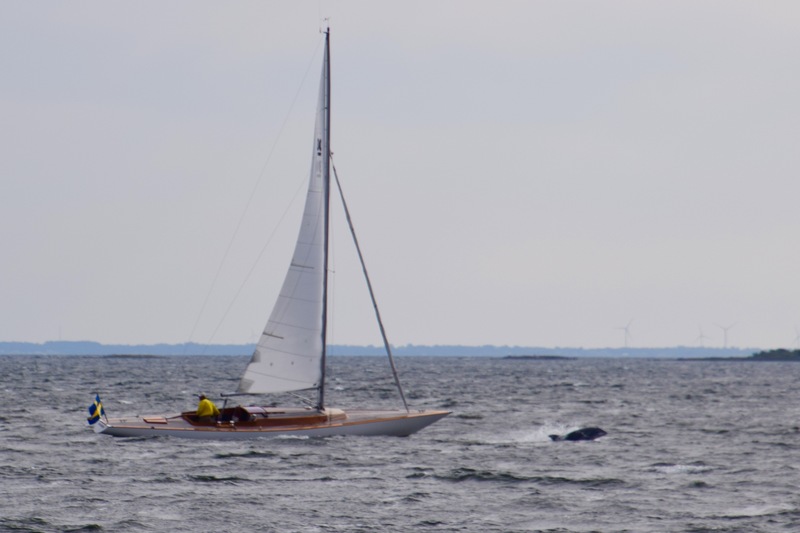 Slowly making her way North, up till the Islands around Stockholm. 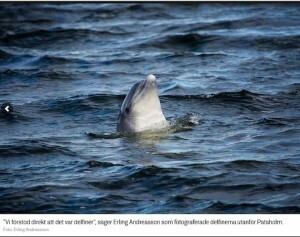 There this wild dolphin swam for days in front of the Swedish aquarium Kolmården, where the captive dolphins live. She was even in front of the house of their research leader Mats Amundin. 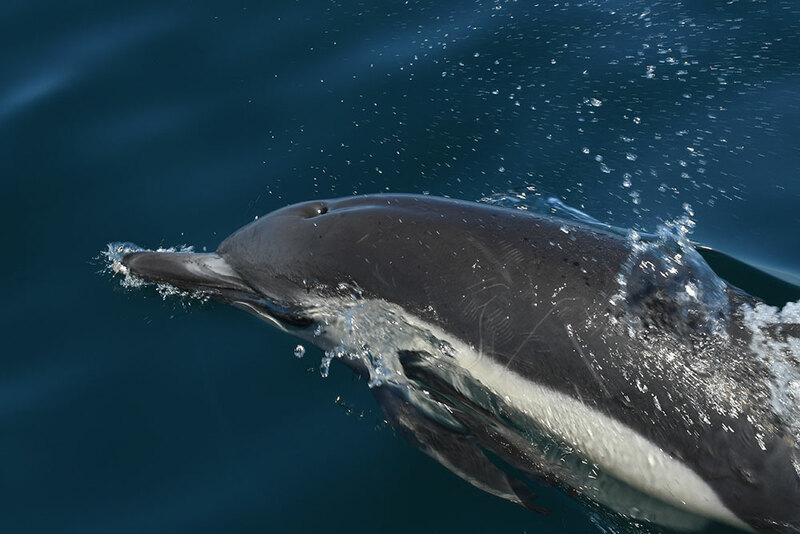 The media gave the dolphin the name; ‘Vilse’ (Lost), which is rather unfortunately chosen, because I have the strong feeling that there was nothing lost nor erratic about it this very courageous and heroic journey. A few weeks later the ocean played a role again, it receded, water levels were unusually low. 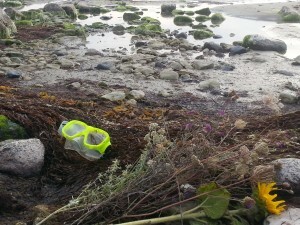 A bit of ocean bottom at the coast became visible, and, now the really sad part;…. 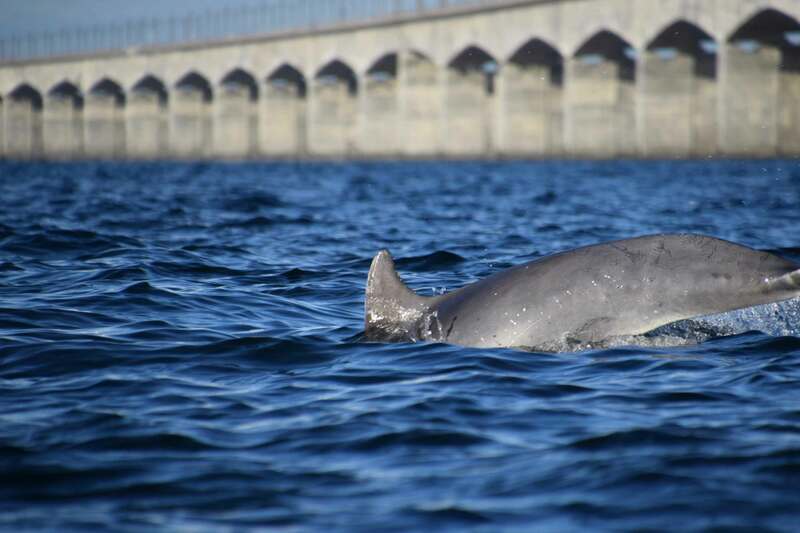 the body of this very courageous dolphin revealed herself, close to the Dolphin Swim Club. In this how we found out that she was a female. Just that weekend, Ian Graham, a well-known author and organizer of dolphin retreats, visited us. Since we all consider dolphins as our relatives, we went to the place she was found and put some tears and flowers on that spot. Honouring her courage, and trying to understand her journey, and what she clearly wanted to share with us all, humans. Dolphins seem to master the art of living in peace, harmony and joy. I am sure that they weep too, for every child, woman and man that has been sinking into their world in the Mediterranean Sea lately. We took that as a clear calling from the cetacean consciousness, an encouragement to go on with the Dolphin Swim Club. All the more in honour of the lonely dolphin who undertook such a brave journey into the unknown. 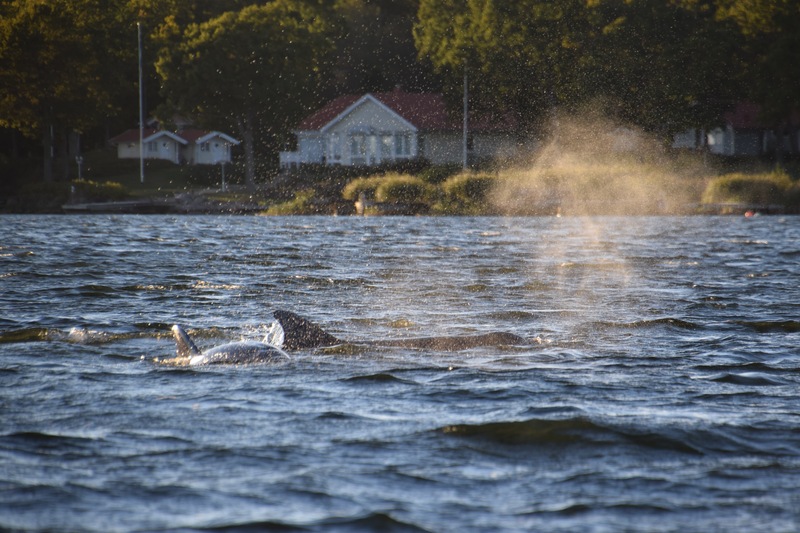 Last weekend, at the time of the launching of the Dolphin Swim Club, another dolphin sighting came in the news; A pair of bottlenose dolphins have been filmed just North of Stockholm, jumping and frolicking about for over 3 hours! And yesterday, as I was writing this story, these two showed up in front of the ‘headquarters’ of the Dolphin Swim Club!!!!! 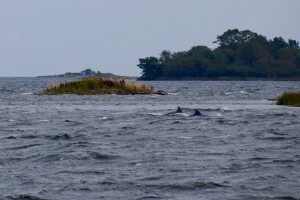 Again, bottlenose dolphins are not native to the Baltic Sea. 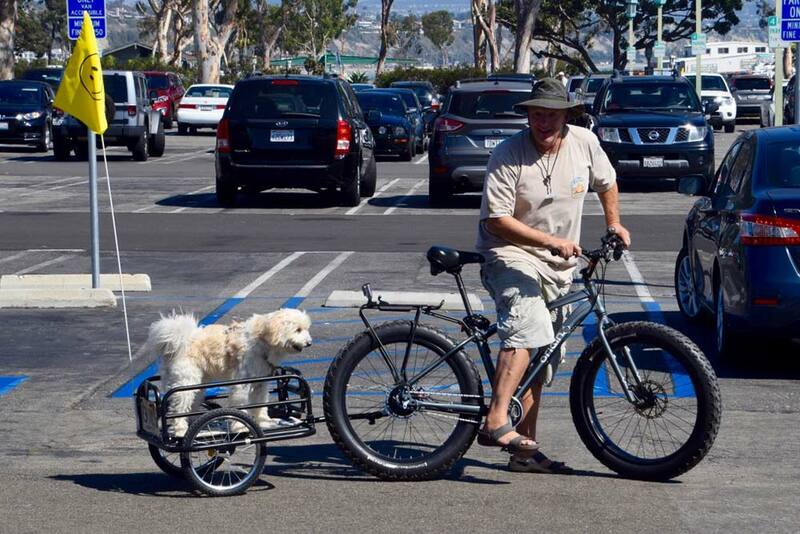 This is by all means a wondrous event…. As I stated that I am the co-founder of the Dolphin Swim Club, apart from working together with a great team, including my beloved husband, I meant it as to state that it is in partnership with the Dolphins. The dolphins are inviting you to become part of their world. And dear reader; can you think of a better name for ‘Vilse, (Lost)?